October 4, 2011 - The National Business Aviation Association (NBAA) will welcome Los Angeles World Airports (LAWA) as a new participant at its 64th Annual Meeting and Convention — distinguished as the world’s premier business aviation event—slated for Oct. 10-12, 2011 at the Las Vegas Convention Center. Van Nuys Airport (VNY) Manager Jess Romo will use the opportunity to interface with key business, government and industry leaders, and launch a new era of collaboration on marketing the airport’s global aviation services. In addition, Romo and executives from VNY’s major aviation companies will participate in a special meeting with NBAA President and CEO Ed Bolen and National Air Transportation Association President Jim Coyne on ways to promote the airport’s value to corporate aviation customers and local community members. Curt Castagna, president of the Van Nuys Airport Association, a non-profit tenant membership group, said the convention marks just the beginning of LAWA’s new partnership with fixed base operators and trade organizations to promote Los Angeles’ leading general aviation airport. For the first time ever, LAWA will participate as an exhibitor at the NBAA Schedulers & Dispatchers Conference to be held on January 15-18, 2012 in San Diego. The event draws individuals who are directly responsible for the scheduling and dispatching of aircraft at flight departments of all sizes throughout the world. In addition, NBAA has selected VNY as one of four locations in the U.S. to host a Business Aviation Regional Forum on April 12, 2012. The day-long conference provides business aviation professionals the opportunity to network, view product and aircraft displays, and discuss issues affecting their operations. VNY’s enhanced marketing efforts follow completion of more than $8 million in major airfield improvement projects over the past five years, including; drainage and grading improvements to all VNY Runway Safety Areas to enhance the safe movement of aircraft on adjacent runway ground surfaces in case of inadvertent entry. Construction of a parallel taxilane (Alpha 3) south of the existing taxilane (Alpha 2) to allow for safe and simultaneous aircraft taxi operations. Installation of pilot-controlled lighting that allows pilots to select the intensity of runway edge lights on approach. Reconstruction of main taxiways (Delta, Golf and Kilo) to replace deteriorating pavement. Installation of 23,170 linear feet of new fencing, 260 feet of block wall, 28 gates and new airfield signage to enhance security. Replacement of existing signage with lighted signage to meet FAA recommendations. In addition, Van Nuys Airport tenants have completed or initiated over $114 million in hangar and office space redevelopment projects since 2006; Maguire Aviation—Completed construction of a new 61,000-square-foot hangar and has a new 10,000-square-foot terminal building under construction. L.A. Fire Department—Completed construction of a new Air Operations Unit facility including 114,943 square-feet of hangar and office space, a fire station and maintenance area. Castle & Cooke—Will construct a new 37,800-square-foot hangar facility with 11,275 square-feet of adjoining office and shop space to replace existing hangars. Also Aerolease Group completed retrofit and remodel of over 125,000 square-feet of hangar and ramp area, plus construction of a new six-acre, 150,000-square-foot facility with a terminal building, hangar space, and attached shop and office areas. Propeller Aircraft Park will construct a 30-acre propeller aircraft park with hangars, tie-down parking, office and meeting space, maintenance and fueling facilities, a restaurant and museum. Pentastar Aviation completed construction on a 4,400-square-foot interim fixed base operator facility in preparation for future property development. “VNY is a major employment center in our community, supporting more than 12,000 jobs,” Castagna said. 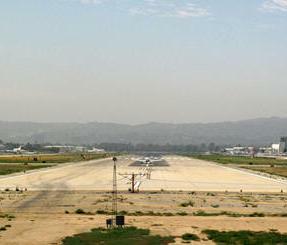 “Continued economic development enhances the airport’s position as a major economic engine in the San Fernando Valley.” VNY has also invested significantly in noise mitigation programs to reduce the impacts of airport operations on the local community, including the installation of a new $3.4 million Airport Noise and Operations Monitoring System and near-completion of an $11.8 million residential soundproofing program providing sound insulation to 779 neighboring homes and apartments. “The Van Nuys Airport community has a strong message to communicate about the substantial investment we have made, and continue to make, to preserve our rank as a world leader in corporate aviation,” Castagna said.